"...Real or unreal... it doesn't matter! To live in their own dimension: that is the point!" Sensation...the action of the senses, in other words letting loose the interior world that makes unique each of us. My interior world is always looking for beauty, even where there is none! I go through deserts as though they were oases, I sit at an empty table as though it was a banquet, I observe grey as being a rainbow of colours, which catches my eye and animates my soul, thirsty for emotions. My photography project is not intended to desecrate traditional photography, but simply to express my desire to explore new horizons, to go beyond the visible, to evoke images of a positive reality, although unreal, which differs from reality, almost always showed in black and white shots, to highlight the misery of mankind. In my shots it is colour that gives the subject a form, it is colour that let you perceive the form of subject, and it is light that, through its different strokes, draws a face, a shoe, a landscape, much like the paintings by the Impressionists. 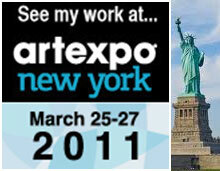 Since 25 to 27 march 2011, I will set out my work at the booth n. 1014 in the prestigious International Art Expo New York. Meet Maria Paola personally in booth n.1014!